Did Melania Trump have the White House exorcised before she would move in? 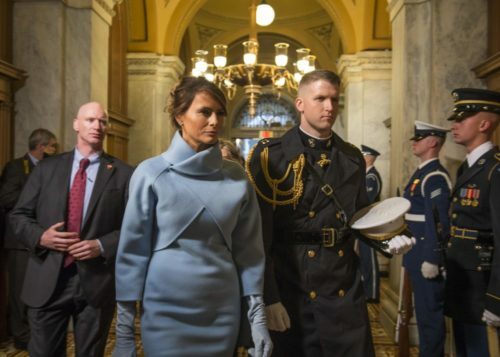 A far-right pastor from Indiana has made the bold, and unsubstantiated, claim that First Lady Melania Trump refused to move into the White House unless it was exorcised first. Preacher, and self-described faith healer, Paul Begley, who hosts the radio program “Coming Apocalypse,” made the statements while appearing on Sheila Zilinsky’s “Weekend Vigilante” podcast. “When the president allowed 40 pastors to come into the White House and anoint him with oil and lay their hands and pray on him—seven times he’s done this—that’s unheard of…The guy’s got flaws, we all do, but at least he’s humble enough in recognizing he needs God enough he keeps bringing them in for the prayer,” he claimed. He had nothing to say as to why she failed to move in to the White House for months, only doing so in June. Listen to the exchange below, via Right Wing Watch.